Your Oyster Recipe of the Day: Spicy Grilled Tequila Oysters. Fire up the grill and get ready for some yummy oysters! Linkie Marais grills oysters topped with a spicy chipotle, lime, garlic, and red onion compound butter. When she takes them off the heat, she gives each a splash of tequila and chopped cilantro. Not including the oysters and tequila, combine the rest of the ingredients together in a small mixing bowl. Using a fork, mash the ingredients together until mixed well. Spoon butter mixture onto a piece of plastic wrap. Roll the wrap into a log and then chill the butter for about 1 hour. Preheat grill to approx. 450 F.
Cut the butter log into thin coins. Shuck oysters without spilling too much of the liquid. Place oysters on the grill and cook for 2 minutes or until they start to bubble slightly. Place a butter coin on each of the oysters, then cook for another 1-2 minutes or until the oysters are bubbling. 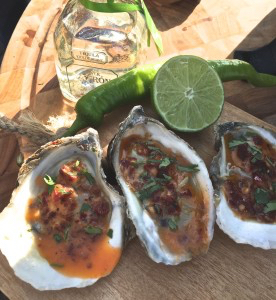 Remove oysters from the grill and spoon ¼ teaspoon tequila over each oyster and sprinkle with chopped cilantro. Serve immediately with lime wedges. Find dozens more grilled oyster recipes, toppings and cooking tips from your favorite magazines, chefs, cookbooks, and food blogs right here on Oyster Obsession.